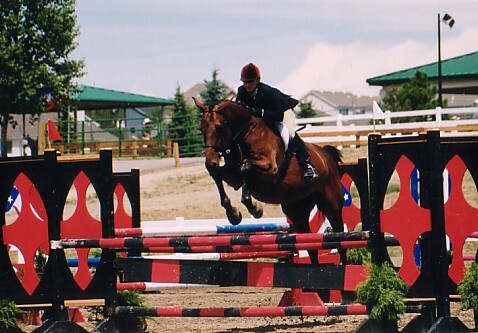 Elite Show Stables is named after my beloved horse Elite De Beaumont, or more fondly known as Eli. I showed most of my junior years on him as well as into adult hood. He very sadly had to be retired in 2002 when he was diagnosed with a neurological condition. 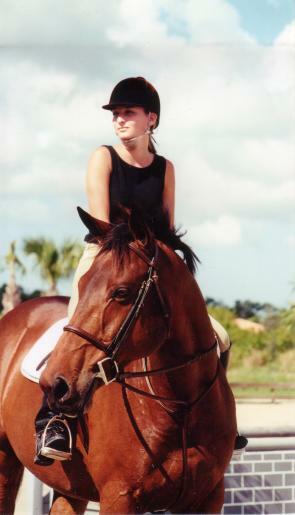 He continued to be a great friend and companion to both myself and other horses that needed company when he moved out to California with me in 2004. Elite Show Stables was created in 2005 and it only seemed appropriate to name the barn after the horse that influenced me the most. 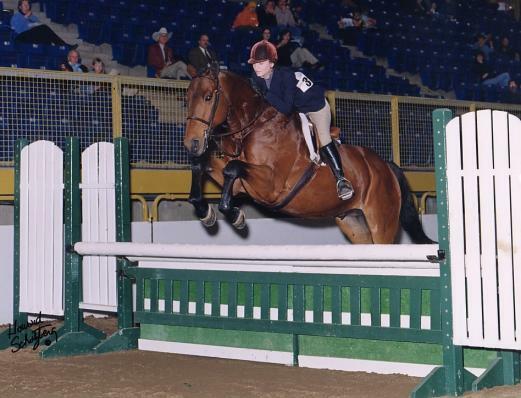 He had always been my best partner in the show ring and my inspiration and strength to follow this career path. 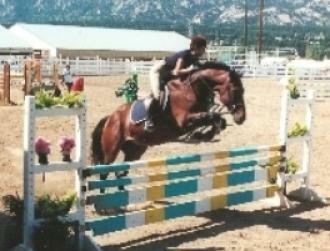 He brought me so much joy and success in the show ring that I wanted to be able to share that with others. Elite De Beaumont, or more fondly known as "Eli" very sadly passed away on the evening of Sept 14, 2007. He had an extreme case of acute colitis and with loved ones nearby he very tragically had to be put down. He will be greatly missed, but his namesake lives on in Elite Show Stables. He was an incredible competitor in the show ring and a loving companion on the ground. He competed all over the country at all of the largest and most competitive venues. He truely loved to compete and would jump absolutely anything you put in front of him. He was one in a million and he will be greatly missed. Thank you to everyone that has helped me through this hard time. Your love and support mean a great deal to me. I know that his goofy personality and incredible talent touched a lot of people. And to my dearest Eli......I will miss you so very much. I loved stepping in that show ring with you, I could always count on you! We were a great team in the ring and you were my companion, my friend, and my soul mate on the ground. Some of my very best memories belong with you. Our favorite time together was when you were laying down with your head in my lap and it seems appropriate that you chose to leave this world in the same way. You will be greatly missed and I know that you were a once in a lifetime horse. again, just as we remember them in our dreams of days and times gone by. miss someone very special to them, who had to be left behind. suddenly stops and looks into the distance. His bright eyes are intent. over the green grass, his legs carrying him faster and faster. "Soon I shall go to sleep, in hopes of seeing him again. His intelligent soft eyes, his elegant head. His soft heart, and his four legs. For my horse is a dream, a dream of the making."